I was a young movie fan when I first saw No Time For Sergeants. 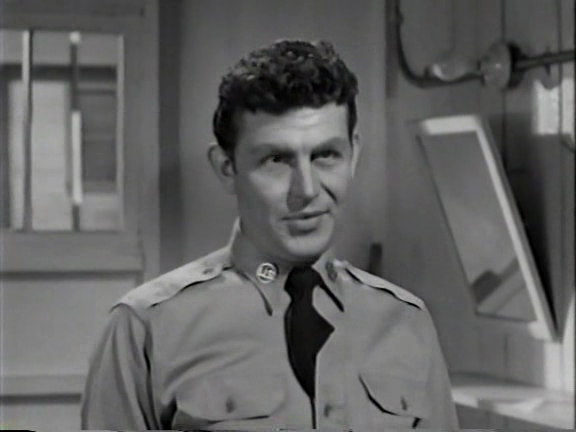 I grew up a rereuns of The Andy Griffith Show, and at the time I thought Griffith was one of the best actors out there. Griffith's performance as Will Stockdale reminds me a lot of Gomer Pyple, which would be a spinoff from Griffith's show in the 1960s. 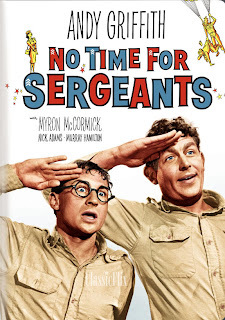 No Time For Sergeants is a 1958 American comedy film directed by Mervyn LeRoy starring Andy Griffith and featuring Myron McCormick, Don Knotts and most of the original Broadway cast. Warner Brothers contract player Nick Adams joined the cast as Stockdale's fellow military draftee Benjamin B. Whitledge, as did Murray Hamilton as Irving S. Blanchard. The film is based on a play inspired by the original novel. Will Stockdale is a backward, backwoods rube from Georgia who may or may not be smarter than he looks. Accused by the government of being a draft dodger, it turns out that Stockdale's draft notices have been hidden from him by his father, who doesn't want the boy to leave home and be ridiculed. They report to boot camp, where Stockdale and his equally dim, but smarter friend, Ben Whitledge, begin the struggle to join the infantry (In real life, the Air Force does not have an infantry.). Stockdale is incredibly strong and can drink any man under the table, but beyond that he is a hayseed who makes one idiotic mistake after another. He proceeds to make life miserable for the man in charge, Sergeant King, who is approaching retirement and likes his barracks to be quiet and calm. In exasperation, the sergeant places the country bumpkin on full-time washroom duty. Stockdale believes his new position of "P.L.O." (Permanent Latrine Orderly) to be a promotion. The happy-go-lucky Stockdale feels that King must be "the best dang sergeant in whole dang Air Force." The totally unhappy Whitledge wants no part of it, lamenting that the rank of "Airman" is "like something from a funny book." Ben wants to be assigned to the infantry instead. He says, "In the War Between the States, it was the infantry that did the fighting," which is understandable, airplanes not having been invented yet. A company inspection takes a surprising turn when Stockdale's immaculately clean latrine is what impresses King's superiors most. King gets into hot water, however, when Stockdale opens his big mouth and reveals that the sergeant kept him on bathroom duty on a permanent basis while also neglecting to have the recruit complete all the required military exams and paper work. Rushing him through testing, King bribes Stockdale by promising to give him his wristwatch if he can pass. Stockdale flummoxes and frustrates the various officers who make him take a manual dexterity test (conducted by Don Knotts), a psychiatric test, and an eye exam, amazingly managing to get by after driving them all crazy. Stockdale gets the wristwatch as a reward. Blanchard tells King to get three passes to go to a local bar, "The Purple Grotto" where Sgt. King and Pvt. Blanchard try to get Stockdale drunk in order to make him look bad and King look good. He admits he has never drank...store bought liquor. King and Blanchard are inebriated, but Will is still sober. Stockdale says the only alcohol he previously had was what his father made with corn, grain and kerosene. Blanchard buys Lighter Fluid from a cigarette girl. Mixing gin and bourbon with kerosene ... Will drinks it and says "it's familiar." Then a drunken Army infantryman walks by and a barroom brawl begins. Stockdale leaves behind a fighting Blanchard and King; as he walks past the Air Police, he tells them that upstairs is the bar. The colonel and captain later inspect the latrine and barracks. Will has mechanically rigged all the toilet seats to open simultaneously in a "salute". While Blanchard is arrested and detained by the Air Police, M/Sgt. King is found filthy in a torn uniform, later in the latrine, and is summarily reduced to private rank, while Whitledge was blamed for King's appearance and is also placed in disgraced status. As King goes back to his office dejected, he admits to Stockdale that he and Blanchard had been trying to trick Stockdale to get him out of the way so that King would not look bad, but their effort backfired. King also admits he had grown to like Stockdale and became his reluctant and inadvertent mentor to success in the Air Force. The story ends with Stockdale and Whitledge (who now has disdain for Stockdale for ruining his image in front of the captain back in the barracks) flying to Denver in an obsolete B-25 medium bomber. Stockdale's assignment is tail gunner on the bomber. After putting the plane on Autopilot, the lazy pilots fall asleep, and the airplane soon becomes lost at night over what the navigator thinks is the Gulf of Mexico. They really are flying over Nevada Test Site|Yucca Flats, Nevada during an A-bomb test called "Operation Prometheus". The radio operator on the plane was left behind at the base, so Stockdale and Whitledge must radio to obtain their real position, however, the radio is inoperatable. Stockdale remembers that back home in Georgia, his father would spit into the radio and smack it to make it work. Stockdale repeats the method, and the radio works. Military radiomen on the ground, confused by Stockdale's folksy, clownish speech, frantically rouse a general from his sleep to confirm that Stockdale is not a prankster, and to give Stockdale emergency flying instructions. Meanwhile, a fire breaks out in the aft of the plane. The Air Force and Army are put on full alert. Stockdale and Whitledge bail out of the plane just before it crashes, and are declared dead by the promoted-back-to-Sgt. King. During an Air Medal ceremony honoring them as fallen heroes, they reappear, and the Air Force has to cover up that the pair are alive to avoid an international public humiliation. Stockdale suggests both he and Ben (who finally forgives Stockdale for his unintentionally innocent flaws, as he thought he and Stockdale were to be executed for being deserters, inadvertently faking their deaths and for perpetrating a public fraud at the ceremony) be transferred to become infantrymen. An agreement is reached by two former West Point classmates, General Vernon I. Pollard, USA and General Eugene Bush, USAF, who also heartily approve of Stockdale's last request—to have Sgt. King transferred with them to the infantry.